For a special birthday, it can be really difficult to know what to get. One unique gift that is fascinating to receive is a newspaper from the day you were born. So recently I decided to order one for my husband from Historic Newspapers. Historic Newspapers have a variety of original newspaper gifts, from newspaper books, sports books, and This Is Your Life books to nostalgic gifts such as Peter Rabbit and Famous Five books. For my husband's 50th birthday I decided to get him a newspaper from the actual day he was born. When you order you can choose from a range of papers available at the time, from The Times to The Sun, the Daily Mirror to the Evening Standard, as well as regional papers. 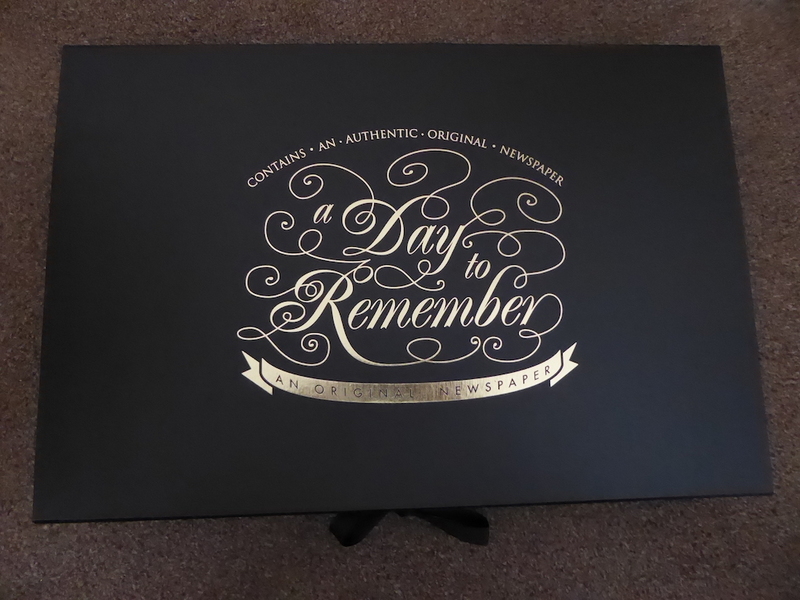 You can then choose a presentation option, such as a gift box, a luxury keepsake case, a frame or add wine or spirits. A personalised certificate can also be included to make that gift extra special. So within a few days, the gift arrived. I chose the luxury keepsake box and thought it made the gift look extra smart, in a black box with gold embossed writing. Inside the box, I was pleasantly surprised to find more than the newspaper I ordered. 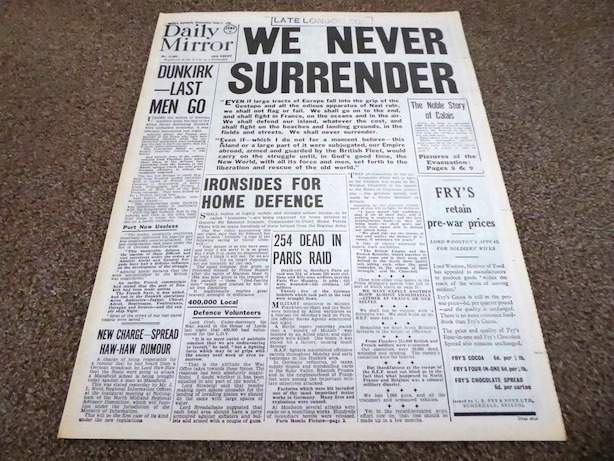 As well as an original Daily Mirror wrapped up carefully in tissue, there was an also a copy of the Daily Mirror on the day of Dunkirk, in 1940 where Germany advanced into France, trapping Allied troops on the beaches of Dunkirk. as well as a copy of The Times that was 100 years old. Also included was a presentation certificate of authenticity. 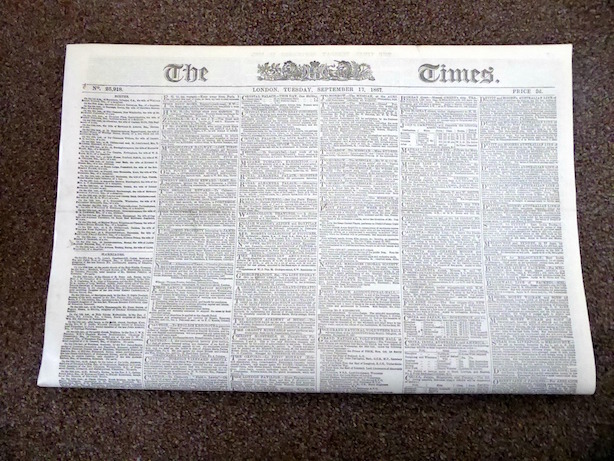 The original Daily Mirror was in excellent condition and wrapped carefully in tissue. It was really interesting to read too. I forgot how much cigarette advertising there used to be as well. 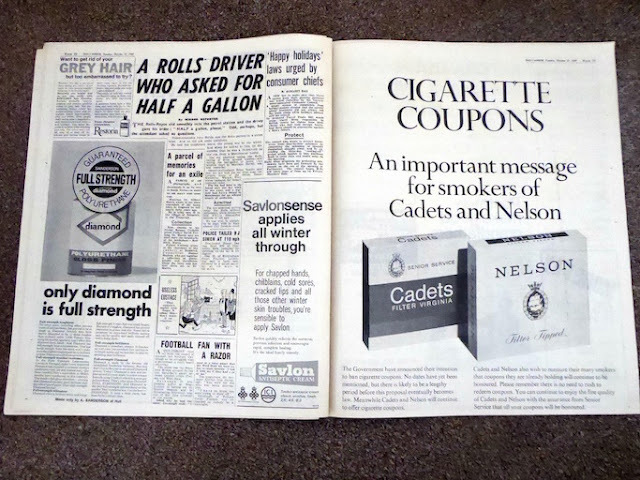 Almost every other page had cigarette adverts illustrating how times have changed. We were obviously not as forward thinking and open-minded as we are now and women's equality, well that was virtually non-existent! As in the words of one advert, "Bill working late today....When he gets home at 8 instead of 6.30, sit him down to a good warming bowl of Heinz' vegetable soup". Where do I start on this advert! Then again the problem pages looked like something out of, well, 1967. "I feel my husband doesn't woo me, as a lady I would like to be wooed". This did make me chuckle. The copy of a newspaper from 1940 made sobering reading. One article on the front page was about 254 people dying in a Paris air raid as well as another about the last men to go from Dunkirk. In fact, the newspaper was all about the current war at the time - WWII. It makes you realise that even though we are at attack from terrorism today, at least we are not involved in a world war and essentially how lucky we are. 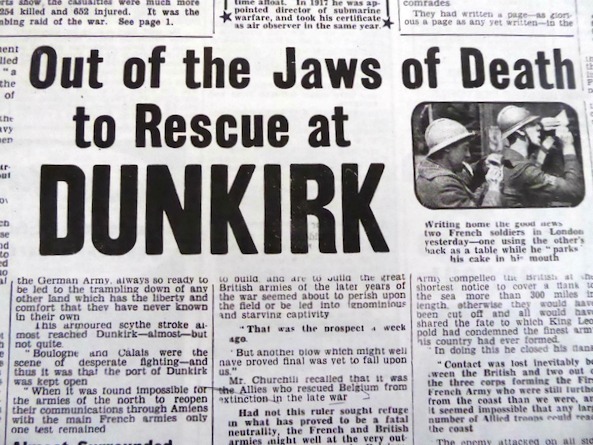 As you can see the coverage of Dunkirk was very prominent in the newspaper from 1940. 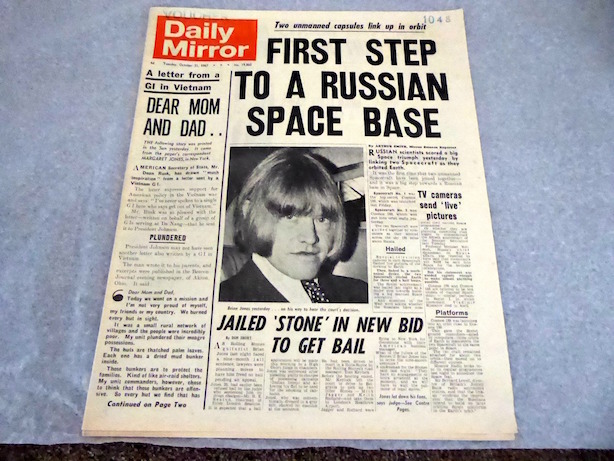 The copy of The Times from a hundred years ago had very different news stories to The Mirror from 1967 and was presented in broadsheet format. The text was small, so small it was difficult to read and there were no photos at all, making it not visually appealing. The first few paragraphs are notices of births and marriages, then what appears to be random notices. One example stated, " The Boys Home, Regents Park Road. The master begs to acknowledge very thankfully a large present of apples and pears sent anonymously". Stories range from a woman "annoying her husband in his business" to "Sicilians are asking for bread". Sections such as Jobs Wanted are advertised in very simple terms, from wet nurse to porter. Very different to our newspapers of today but fascinating all the less. 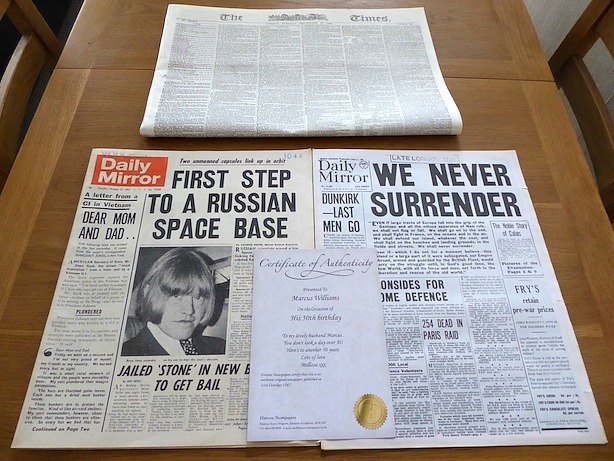 My husband really seemed to enjoy reading the newspapers and I was very happy with the whole package, the presentation box, the certificate of authenticity, the copies of the 1940 newspaper and the newspaper from 100 years ago as well as the original Daily Mirror from the year he was born. 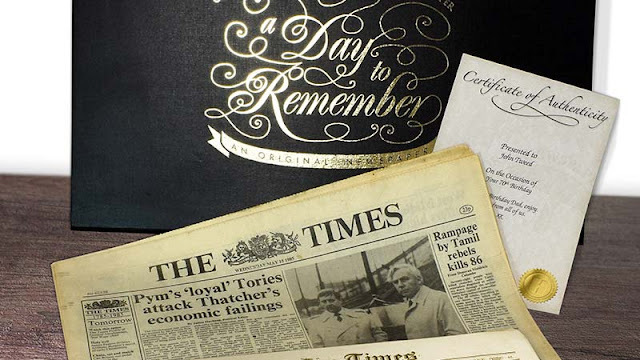 Prices for a birthday newspaper start at £29.99 and the luxury keepsake box with a newspaper from 100 years ago is an extra £35. 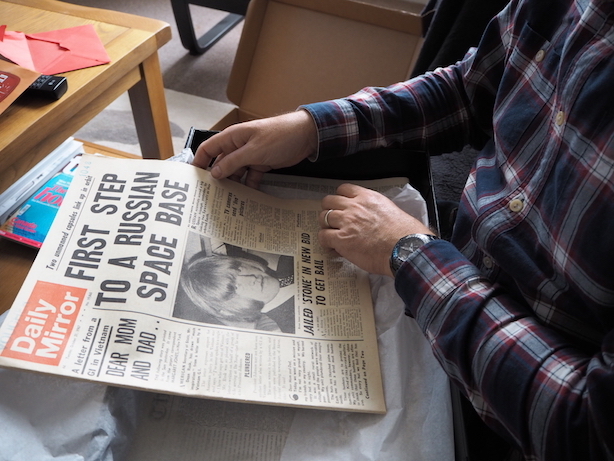 If you want an original and unique gift for a special birthday, whether you are buying for someone who is into history, current affairs or just a curious personality then a gift of a newspaper from the day they were born makes a lovely gift. I quite like the soup advert! At least they were encouraged to just open a can - rather than cook from scratch! What a great idea! Men are normally so hard to buy for too - I bet my husband would love this. This is such a great gift idea. I know I would love it. It must be fascinating to read a full paper from the day you're born - I've only ever seen the headlines of mine. The problem pages sound amazing. As well as that soup advert! Gosh I bet the older papers are eye opening too. Not that I'd be able to read The Times by the sound of it :) I love this sort of thing so thank you for the review. I'm going to take a look at the site. We found it so interesting to read Melissa!